The iconic flavors of apple and cinnamon infuse this simple and moist cake, making it a delicious snack, part of breakfast, or add a dollop of whipped cream and make it dessert! There is not much in this world that is better on a cold day than the aroma of apples and cinnamon baking in the oven. And the result of this delicious baking aroma is so rewarding–a comforting apple snacking cake that will warm bodies and souls. The cake fills a 9 x 13 baking dish, so it makes enough to serve a group if you have guests, or it will possibly last more than a day, if you don’t. In anticipation of the Thanksgiving holiday, my mind has been filling up with visions of warm, wonderful homemade food shared with family and friends. For me, baking is a way to stretch across space and time and connect with people from the past and the present. One book that I like to pull out for inspiration around Thanksgiving time is An Old Fashioned Thanksgiving by Louisa May Alcott, illustrated by James Bernardin. I have been a fan of Louisa May Alcott’s classic novel Little Women since I was an adolescent. That novel made a huge impact on me as a girl growing into a young woman and aspiring writer. When I became a mother and my children were young, my mother gave me the above-mentioned adaptation of Alcott’s An Old Fashioned Thanksgiving. It is a book geared for young children, full of scenic illustrations and a simple, heart-warming story of a New England family in the 1800s. I was so excited to read a book by one of my favorite authors to my children, and they have enjoyed it too. Along with the story there are descriptions of the food the family ate for their Thanksgiving meal. One of those dishes was apple slump. With a name like that, I was really curious what it would taste like. 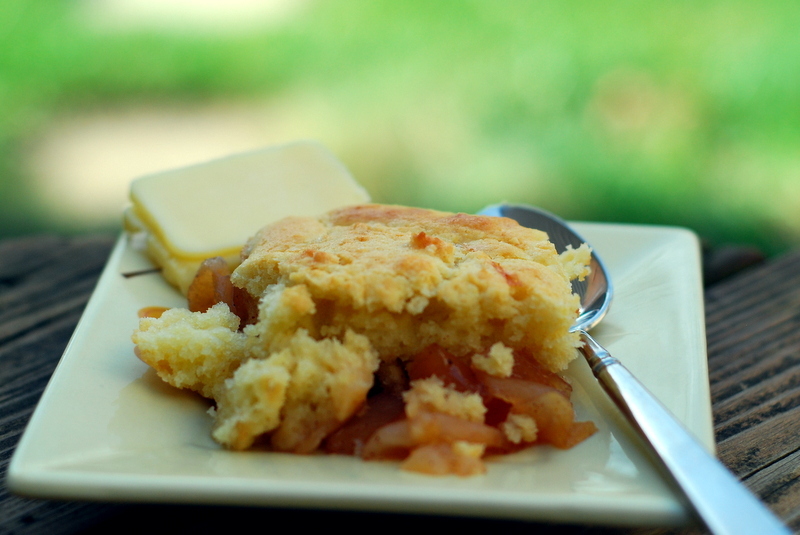 Luckily, at the back of the book, there is Louisa May Alcott’s recipe for apple slump, so my daughter and I made it a few years ago. I have been making it around Thanksgiving time ever since. The spiced, baked apples are topped with a slightly sweet, rich cake-like batter. The recipe suggests we serve it with whipped cream, and I also think vanilla ice cream is lovely with it. Today, I served it on its own, and my family ate it gladly for dessert. I personally like to eat any baked apple dish with thick slice of cheddar cheese. My grandma always said apple pie was best that way. 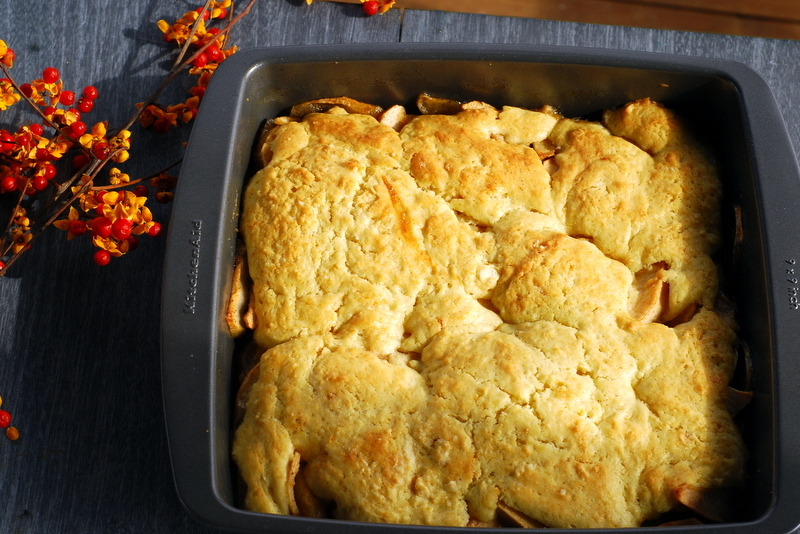 I have posted Louisa May Alcott’s recipe for apple slump below, as it appeared in the book An Old Fashioned Thanksgiving. This is a delicious dessert, and a very fun baking project to do with children in conjunction with reading the book, if you are so inclined. Preheat the oven to 350 degrees. 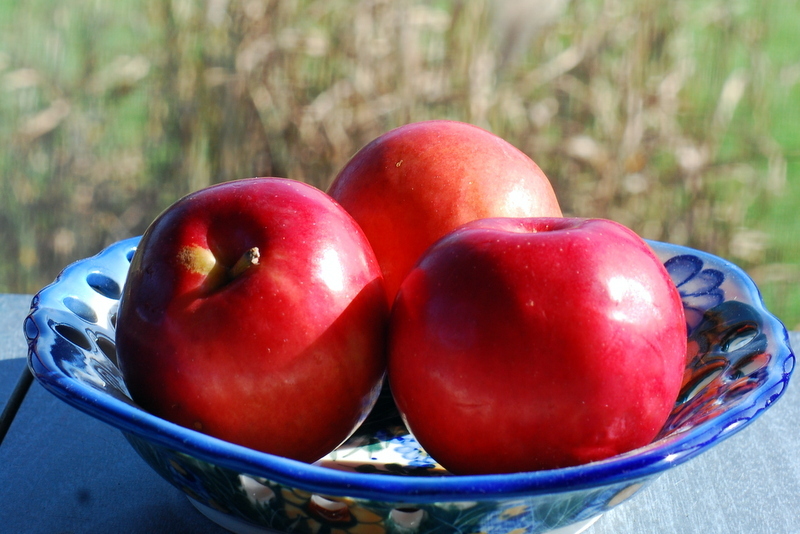 Pare, core, and slice the apples. Lightly grease the inside of a 1 1/2-quart baking dish (I used a 9 in. x 9 in. square baking dish) with butter. Put the sliced apples into the dish. In a small bowl, mix the brown sugar, nutmeg, cinnamon, and 1/4 teaspoon salt. Sprinkle the mixture over the apples and stir to mix. 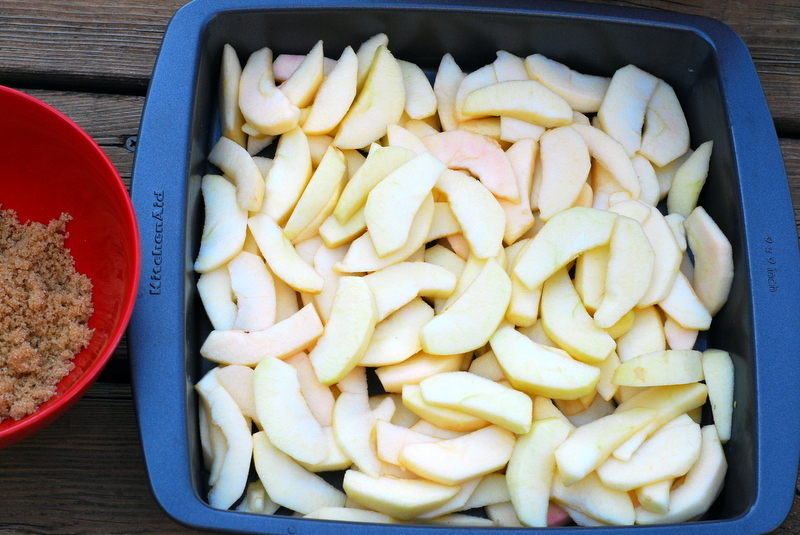 Bake apples uncovered until they are soft, about 20 minutes. While the apples are baking, stir together into a bowl the flour, baking powder, 1/2 teaspoon salt, and sugar. Mix into this the beaten egg, milk, and melted butter. Stir gently. Spread this mixture over the apples and continue baking until the top is brown and crusty (about 25 to 30 minutes). Serve with whipped cream. Enjoy!